Participants in the Kuwait International Conference for Reconstruction of Iraq (February 12-14, 2018) pledged approximately $30 billion out of the $88 billion the government of Iraq (GoI) hoped to secure.1 Nonetheless, the conference reflected a conceptual shift by both the GoI and international actors. Namely, the private sector is expected to play a major role in driving the country’s reconstruction and development. This could generate significant opportunities for private investors, as well as legal risks. The Republic of Iraq’s National Investment Commission (NIC) revealed 157 projects for which it is seeking funding, with a heavy emphasis on the oil & gas sector, transportation infrastructure and agricultural projects. Some of these projects boast expected returns on investment rates of 17% or 33.6%, although it is unclear how the NIC estimated these figures. Iraq is working to become an attractive destination for foreign investors. Entire segments of the economy are under development, and commercial competition should remain low in the early stages of reconstruction. But structural reforms will be critical to attract and retain international investments. In addition, the outcome of the May 12, 2018 parliamentary and provincial elections may significantly influence implementation. The GoI set out its governing approach to reconstruction in the Iraq Reconstruction and Development Framework (the “Framework”) for the 2018-2027 period.10 The Framework’s financing strategy rests on four priority areas: (1) mobilizing (international) public funding; (2) leveraging domestic and international private sector; (3) appropriate allocation of resources through commercial or concessional models; (4) improving financing delivery. To achieve these goals, the Framework pledges legal reforms to improve the “business and investment environment, revenue sharing, private sector development initiatives, reducing agricultural tax and subsidy distortions, establishing mobile payment networks, and improving the regulatory and supervisory framework for financial transactions.”11 Further, the GoI commits to service pending debt to the private sector, reform state-owned banks, and adopt de-risking strategies in line with Kuwait conference pledges: political risk insurance, payment and loan guarantees, as well as blended finance. The Framework puts considerable emphasis on structural reform, acknowledging the country’s challenging legal and commercial environment. Favorable investment opportunities will hinge on the effective implementation of these reforms. Foreign investors’ preliminary due diligence thus remains critical in safeguarding their investments in Iraq. 2 Based on authors’ compilation of publicly available sources. The origin of 7 billion USD remains unclear. 3 Notwithstanding the fact the Bank has been without a quorum on its board since 2015, which prohibits the agency from offering financing of more than $10 million USD. 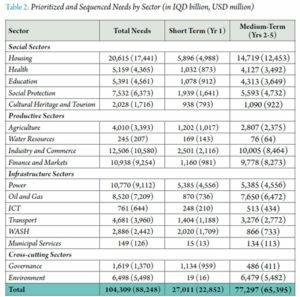 5 Republic of Iraq, Presidency of Council of Ministers, National Investment Commission, “Major strategic (large) and (medium-size) projects available for investment according to sectors” (Jan. 2018), http://www.iraq-businessnews.com/wp-content/uploads/2018/01/Major-Strategic-Projects.pdf. 10 Id. at 1, 2.